After playing 16 of their last 19 games on the road, the players enjoyed a day off yesterday. The Phillies and Giants have played the fewest home games (54) but that’s about to change. For the Phillies the next nine games are at Citizens Bank Park where they are 25-29. It all begins tonight against the Colorado Rockies. Phillies and Rockies split four games in Denver last month. **They lost, 5-4, to the Rangers’ Jake Diekman on Wednesday and beat him with a 5-run eighth yesterday, 12-9, splitting a 2-game series in Texas. **Lead the league in runs scored (603); allowed third most runs (583). **Hitting .304 at home; .249 on the road. **Rookie OF David Dahl has begun his big league career hitting in 17 straight games which ties an NL record. 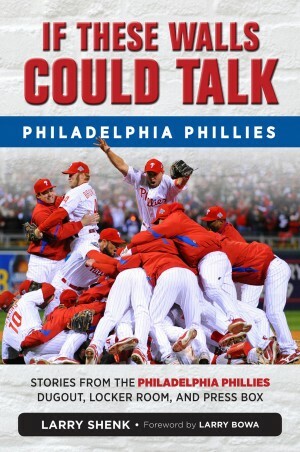 **They are 17-27 at Citizens Bank Park. A sold out crowd packed the Diamond Club yesterday for the annual Alumni Luncheon that kicks off the Toyota Alumni Weekend. 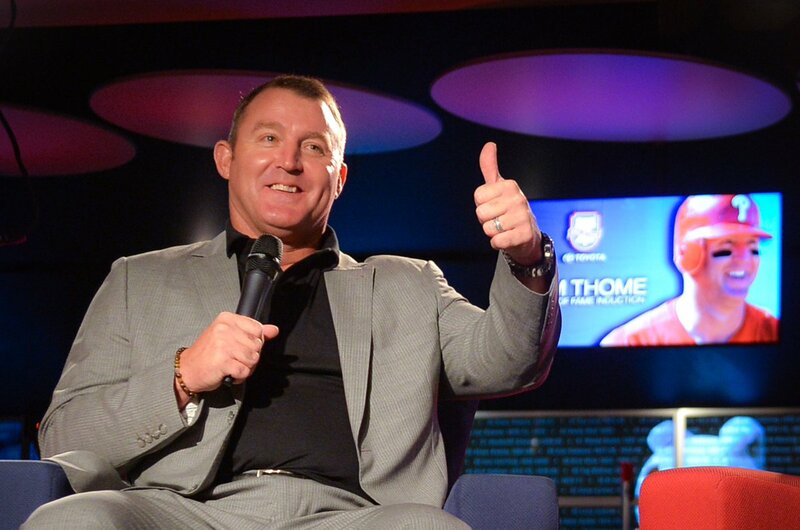 Jim Thome, being inducted into the Wall of Fame tonight (festivities begin at 7), was the honoree. In my 50-plus years with the Phillies, Jim may be the most genuine and humble player with whom I’ve dealt. Those two traits were evident during the luncheon. The format was to surprise Jim with guests who would then join him and host Scott Palmer on the stage. Sleepy-looking Larry Bowa was first (“We didn’t get home from LA until 3 this morning”). Then, Ed Wade, Bobby Abreu, Rheal Cormier, Mike Schmidt and Charlie Manuel. “I knew Chuck (Manuel) would have to be on the list,” Thome laughed. During the closing ceremonies of the Vet, Schmidt and Thome hugged after they touched home plate for the last time. 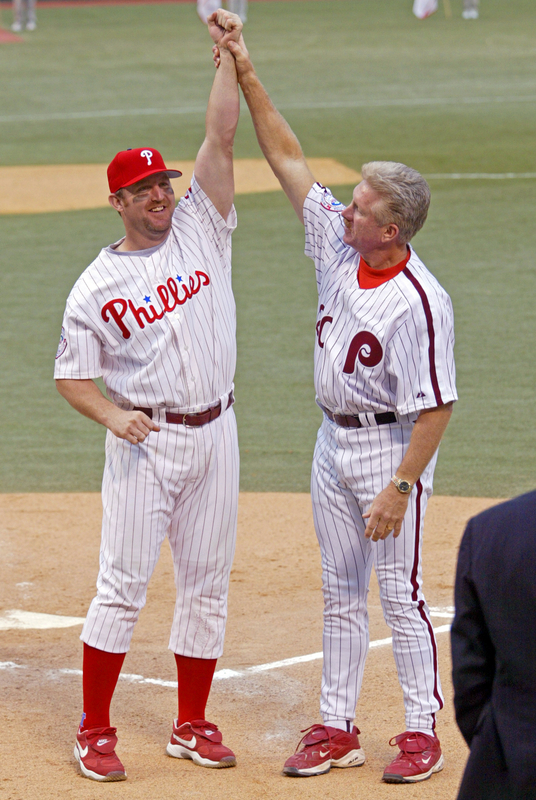 Schmidt grabbed Jim’s left arm and raised it in the air, “passing the torch as the Phillies new power hitter,” Mike explained. “I have that photo hanging in my home. It was such a special moment. As a kid, I used to watch Mike hit all those home runs at Wrigley Field and now we were together,” said Thome. Comcast SportsNet will air the luncheon next Monday evening, time to be determined. Aaron Altherr began the season rehabbing in Clearwater following surgery. He’s one of many major league and minor leaguers who have spent time in Clearwater rehabbing. What exactly is the program? Check http://www.phillies.com/alumni for a story on the Phillies’ program that takes place at Carpenter Field. Lehigh Valley IronPigs (71-47), International League North Division. 2nd place, 3 games behind Scranton/Wilkes-Barre. Won, 4-1, over SWB in a game called after 5 by rain at PNC Field. WP: Anthony Vasquez (3-0), 5-4-1-1-1-4. Combined with Reading, he’s 11-3. LF Nick Williams, 2 H, RBI . . . Adam Morgan (6-1), 7:05 tonight vs. Indianapolis. Reading Fightin’ Phils (77-39), Eastern League Eastern Division. 3-game lead over Trenton. Rained out in Binghamton. Game canceled as it was the last meeting between the two teams . . . Mark Leiter (6-1), 7:00 tonight in Altoona. Clearwater Threshers (29-17), Florida State League North Division. Trail 1st-place Dunedin by ½ game, 2nd half. Split a pair of 7-inning games in Lakeland before 165 fans . . . Game 1: 9-2 loss. LP: Shane Watson, (4-5), 5-8-5-4-0-8, 3 HR . . . Game 2: 1-0 win. WP: Brandon Leibrandt (1-1), 6-4-0-0-2-6, 1 PO. SV: Matt Hockenberry (5). C Austin Bossart, game-winning SF with 1 out in T7. OF Aaron Brown, 3-6, in the DH . . . Luke Leftwwich (2-3), 1 p.m. today in Lakeland. Lakewood BlueClaws (25-19), South Atlantic League North Division. .5-game lead over Kannapolis, 2nd half. 5-game winning streak ended, 3-1, in Kannapolis. LP: Harold Arauz (3-6), 4.2-5-2-2-2-2. LF Cornelius Randolph, HR (2), RBI. 3B Jan Hernandez, 2 2B. CF Carlos Duran, 2 H. Team was 0-8 RISP . . . Tyler Gilbert (6-7), 7:05 tonight in Kannapolis. Williamsport Crosscutters (29-21), New York-Penn League Pinckney Division. 2nd place, 5.5 games behind State College. A pair of 7-inning games vs. Hudson Valley were scheduled to begin at 5:05 p.m. 1-0 win in 1st game that included a 3:38 rain delay. WP: Will Hibbs (3-1). 2nd game started at 11:24 p.m. wound up a 2-2 tie, called after a 25-minute delay by rain. It was last meeting this season between the two teams . . . JoJo Romero (1-0), 7:05 tonight in Mahoning Valley. Gulf Coast League Phillies, (29-12), Northwest Division. 2nd place, 2 games behind Blue Jays. Won, 7-1, over Tigers W. WP: Luis Carrasco (4-2), 5-0-0-0-1-4. DH Jhailyn Ortiz, 2-4, HR (7), 2 RBI. 1B Danny Zardon, 2 H, R. RF Ben Pelletier, 2 H, R. 3B Raul Rivas, 4-5 . . . 12 noon today vs. Yankees West at Carpenter Complex. Same 2 teams at 10 a.m. tomorrow in Tampa. 22nd homer, breaking Granny Hamner’s club record for a 2B set in 1953.
rainout since June 18, 1990, a string of 189 dates. Shea Stadium for his 300th home run. Phillies win, 84. 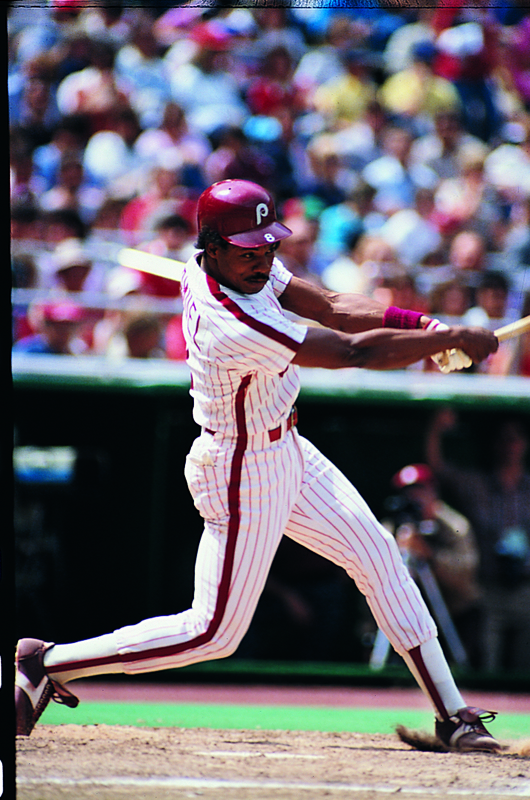 For daily Phillies Phlashback moments visit http://www.phillies.com/alumni. 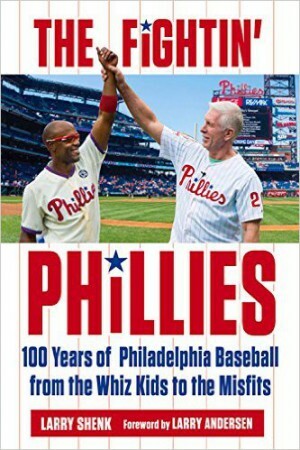 I’ll be signing my new book, The Fightin’ Phils, from12:30 to 1:30 on Sunday at Citizens Bank Park. Location: Section 111 in the main concourse.